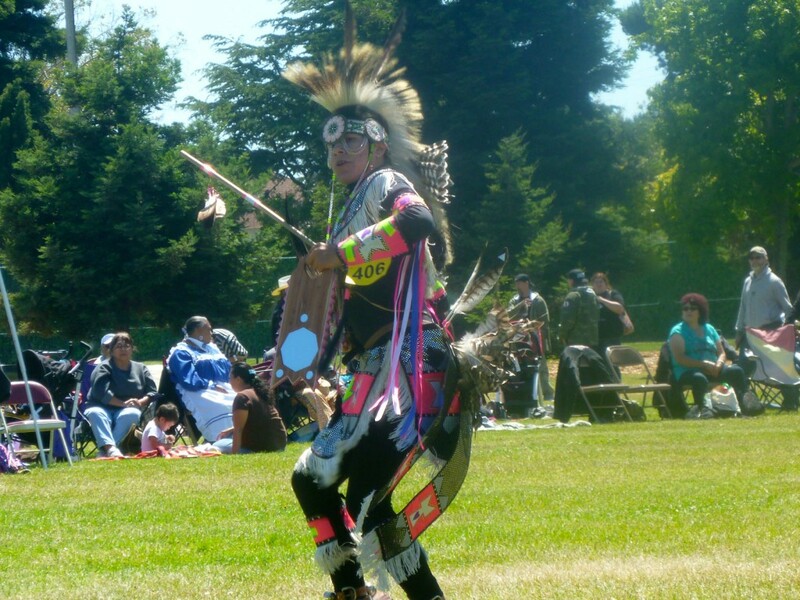 On Saturday afternoon, members of over 50 Native American Indian tribes from across the country gathered to celebrate the 3rd Annual Richmond Native American Pow-Wow in Nicholl Park. The festival brought hundreds of local Bay Area residents to watch and participate in the dances and prayers as singer Wicahpuiluta Candelaria-Ohlone of the Muwekma Ohlone tribe started the day’s ceremony off with a blessing. Organized by Courtney Cummings, a Native American community member and Richmond resident, the festival was set up in a wide circle, symbolizing the Native American traditional circle of life. The dancers and drummers set up lawn chairs decorated with multicolored blankets around the festival to symbolize their tribes. Beaded jewelry, prayer bracelets, arrowhead necklaces and dreamcatchers were just some of the items vendors had to offer during the festival. Those in attendance included Richmond Mayor Gayle McLaughlin, Councilman Jeff Ritterman, and Assemblyperson Nancy Skinner. Richard Levy, a member of the National Native American Veterans Association, performed a “smudging,” a ceremony in which Levy burned herbs and touched those being blessed with eagle feathers. The ceremony is intended to cleanse the spirit and repel evil forces from doing harm to the recipient. The thunderous boom of the Northern drummers troupe from all nations and Southern drummers troupe from the Red Buffalo tribe, along with the voices of singers from various tribes, could be heard echoing throughout the park as residents cheered on the dancers entering the circle’s center arena. The smell of fried bread from Indian tacos as well as the smell of cooking maize wafted through the air as Master of Ceremonies Eric Kimple of the Blackfoot tribe instructed participants in social dances—the Intertribal, Two-Step, and Owl Dance. There was also a princess contest in which girls competed over their dress style, a tribal dance contest, and raffle drawings for an Indian blanket and hand drums. One local Richmond resident who received many compliments on her Northern Cheyenne clothing was Teresa Littlebird. Her handmade outfit was adorned with long bright blue and red beaded panels that displayed roses and butterflies. She wore moccasins, long matching beaded earrings and her brown hair was wrapped and tied with eagle feathers. Littlebird says it took her years to create her regalia and thought it was important to include images and designs that reflected her personality and Native culture. “A Native American dancer performing in a ceremonial jingle dress at the 3rd Annual Richmond Native American Pow-Wow.” The “jingle dress”is a womens style of traditional regalia.I appreciate your openess of wanting to cover our story, but ask for the Chair coordinator of any Native American pow wow when relying on information for a public news story.Jim Becker is with the Richmond Community Foundation and a associate.Thank you, Courtney Cummings.